We have a new eat place that’s close by and very handy. Word has been passed around that East Texas Medical Center in Pittsburg, Texas, has hired a wonderful chef. The ETMC Cafeteria is packed on Sundays with the after church crowd. The Texas Junkin’ Ladies and I dropped by last Monday and tried it out. It was not only good, but very good and reasonable. I had the Chicken Fried Steak with white gravy, homemade mashed potatoes with more white gravy, candied sweet potatoes (an East Texas vegetable), salad, sweet tea and a huge hunk of cake with icing. Unfortunately, we waddled past a scale on our way out of the hospital. I’ve heard the cafeteria’s chef salad with the low-fat dressing is very good. We’ll have to have one on our next visit. The cafeteria is located in the same area that serves as a large waiting room for the various doctors and/or procedures. Like the other day when the gals and I stopped by for lunch, we noticed Rena Pearl waiting for her blood sugar test. We sort of rubbed it in that we could eat lunch and she couldn’t. Rena Pearl didn’t take kindly to our teasing, she looked like she was starving to death from fasting. The East Texas Medical Center is almost brand new and is located a mile or two north of Pittsburg on Highway 271. If you are on your way to Mt Pleasant or to Interstate 30, stop by and have lunch. The cafeteria is located right smack in the middle of the main atrium like building, so you can’t miss it. While you’re there you might as well sign up for that colonoscopy you’ve been putting off for the past five years. Palestine, Texas- It’s almost time to open the curtain at the Historic Texas Theatre in Palestine! 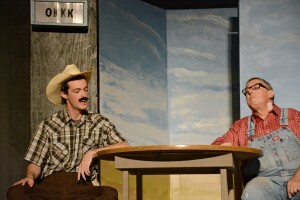 Palestine Community Theatre, Inc. presents Greater Tuna October 3, 4, 5, 10, 11 and 12. 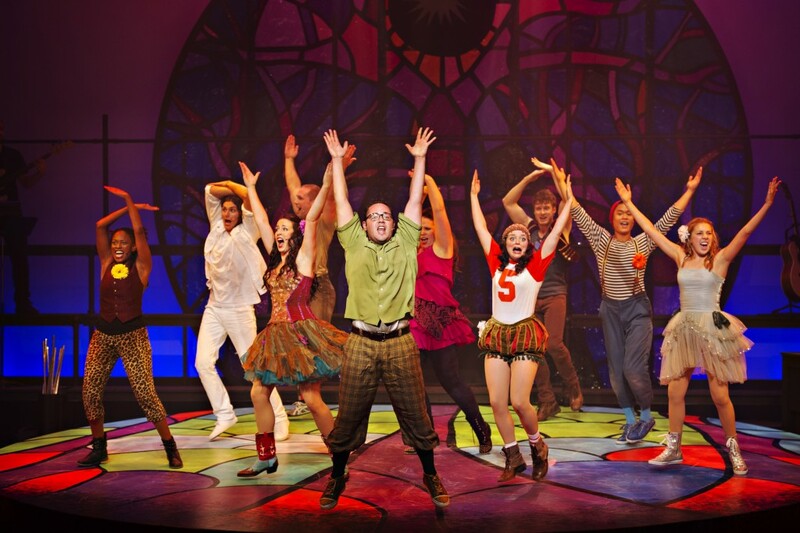 Crockett— Family in town for Thanksgiving?… Looking for something special to do?… Put the leftover turkey in the fridge and bring the WHOLE family to one of the most enduring Broadway musicals of all time in a brand new and up-to-date, intimate, one-of-a-kind production. 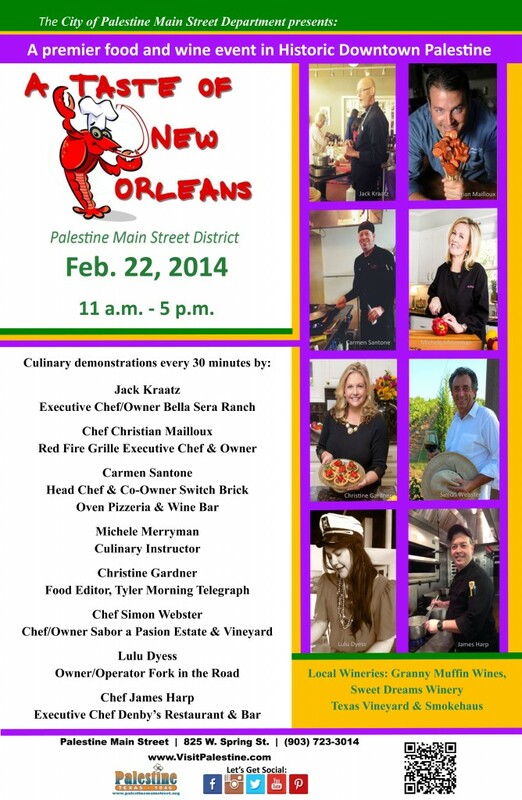 PALESTINE- The culinary tastes of Mardi Gras will fill the Main Street District Sat., Feb. 22, 2014 from 11 a.m. – 5 p.m. during A Taste of New Orleans. This 2nd style cuisine, set against a backdrop of historic buildings decorated for Mardi Gras, showcases the talents of local chefs and highlights the offerings of local wineries. A Taste of New Orleans begins the culinary tour at 11 a.m. and the festivities continue at various locations until the 5 p.m. parade. Local chefs will be doing free food demonstrations and samples every 30 minutes which can be paired with a wine tasting from a local winery.